ViaCloud Technologies helps clients create secure, reliable communication systems that increase worker efficiency, employee and end user satisfaction, and gives IT managers the control and insight they need to adapt and scale the architecture over time. Our experts work with clients to create collaboration solutions that become the reliable foundation on which their critical business processes depend. We offer a full range of collaboration products and services to enable your most demanding workforce and end users. 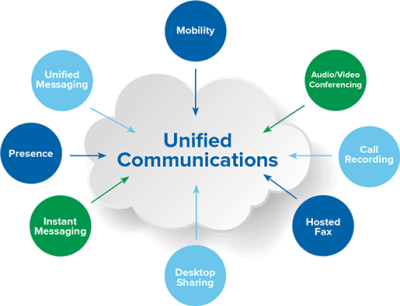 Unified Communications - ViaCloud Technologies’ experts design a collaborative environment that allows for faster decision making by integrating your IP communications applications into a unified solution that leverages the latest technology. Our experts integrate next-generation voice systems with all forms of communication including video and data. Unified Messaging - Messaging applications are core to every organization’s ability to communicate and collaborate internally and with their clients and partners. Our team of experts design and implement solutions that streamline access to client’s messages and allow messages to reach the user across multiple mediums and devices. Instant Messaging / Presence - Instant messaging applications are the launch pad to a richer communications experience, allowing individuals to initiate voice, web, video, and/or group collaboration immediately, based on the known availability of other resources. We provide solutions that integrate communications methods into a seamless user experience. Web and Voice Conferencing - Web and voice conferencing can accelerate problem resolution through real‐time collaboration that isn’t confined to a physical space. ViaCloud Technologies provides solutions that enable faster, better decisions through technology that unites participants from across the globe. Collaborative Applications - By offering the power of social networking, content creation, and real-time communications, collaborative applications enable employees to quickly connect with the people and resources they need to get work done. We provide solutions that enable collaboration with rich media and video from any browser and any site. Collaboration Rooms - ViaCloud Technologies provides solutions that enable your conference rooms to be interactive and enhance collaboration with a full wall of video, easy sharing between participants within the room and remotely, and real-time collaboration via a large and lifelike video experience.